The Philippines' first full-length opera, National Artists Guillermo Tolentino and Felipe Padilla De Leon's most beloved 1957 opera, “Noli Me Tangere” (Huwag Mo Salangin/Touch Me Not) returns to the Cultural Center of the Philippines' (CCP) main theatre, Tanghalang Nicanor Abelardo, from March 8-10, 2019. In partnership with the CCP, in time for its 50th anniversary, with support from the Honorable Senator Loren Legarda, the Tourism Promotions Board of the Philippines, and E. Zobel Foundation Inc., J&S Productions Inc., the producers behind the opera's acclaimed performances at the Kaye Playhouse in New York City (2013), the John F. Kennedy Center for the Performing Arts in Washington D.C. (2014), the Newport Performing Arts Theatre at Resorts World Manila (2014), and the CCP (2017), which commemorated the opera's 60th anniversary, fulfills its commitment anew to keep this masterpiece alive for the young Filipino audiences to experience and enjoy. In this 2019 all-new production, about 200 actors-classical singers, classical musicians, and production crew are joining forces to stage this grand, “elegant affair” (The Washington Post, 2014). Leading the cast are Nerissa De Juan and Bianca Camille Lopez (Maria Clara); Ivan Niccolo Nery and Nomher Nival (Juan Crisostomo Ibarra); Allison Cervantes, Nicola Micaelle Peralejo, and Bernadette Mamauag (Sisa); Joseleo Logdat (Elias); Greg de Leon (Pilosopo Tasyo); Nils Flores and Ronnie Abarquez (Padre Damaso; Abarquez also plays Kapitan Tiyago at certain performances); Lawrence Roxas (Kapitan Tiyago); Noel Comia Jr. and Mari Yapjoco (Basilio), and Santino Juan Santiago (Crispin). Also joining the cast are Mia Bolanos (Dona Victorina), Oliver Pineda (Tenyente Guevarra), Jose Mari Javato (Padre Salvi), Charina Balmores (Sinang), Micah Galang (Andeng), Ma. Krissan Tan (Tiya Isabel), Timothy Racho (Alferez), Ruzzel Clemeno (Don Filipo), Tomas Virtucio Jr. (Albino), and Rare Jireh Columna (Victoria). The large ensemble includes Roxanne Abuel, Neomi Giron, Eden Dumlao, Sheila Gamo, Ma. Rovelyn Bautista, Criselda Go, Ma. Blanca Buesa, Katrine Sunga, Angelica Benipayo, Ma. Arielle Tuason, Erielle Fornes, Ma. Vicella Villasin, Ma. Pilar Ramos, Marifel Motilla, Jose Miguel Espiritu, Lorenz Sarrondo, Renz Nathaniel Cruz, Airo Saret, Kevin Jeremy, John del Rosario, and Joseph Billeza. Co-directed by New York-based event stylist Jerry Sibal, who also does the set design, and veteran actor-director Jose Jeffrey Camanag, featuring the 53-piece NOLI Symphony Orchestra under the baton of Maestro Herminigildo Ranera, “Noli Me Tangere, The Opera,” which is based on the National Hero Dr. Jose Rizal's 1887 classic novel of the same name, tells the timeless story about love, betrayal, and hope set against a repulsive backdrop of tyranny, torture, and murder. The opera in Three Acts follows Juan Crisostomo Ibarra who returns to the Philippines after pursuing scholarly studies in Europe. He plans to open up a school and marry Maria Clara, his betrothed. However, parish priest Padre Damaso, the archenemy of the Ibarras, is out to hinder Crisostomo's plans. “Noli Me Tangere” depicts the abuses suffered by the native Indios at the hands of Spanish tyrants. 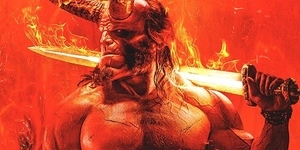 The opera paints a clear picture of the so-called “social cancer” that illustrates the rotten system of governance, the illicit way of the church, and the unfavorable trade of the privileged class. The artistic and design team for this much-awaited production also includes Raul Sunico, project director; Albert Figueras, costume designer; Dennis Marasigan, lighting designer; Ronan Ferrer, chorus master; Dingdong Fiel, pianist and assistant musical director; Alan Dela Rama, graphic and video designer; TJ Ramos, sound engineer, and Jojo Casim, production manager. 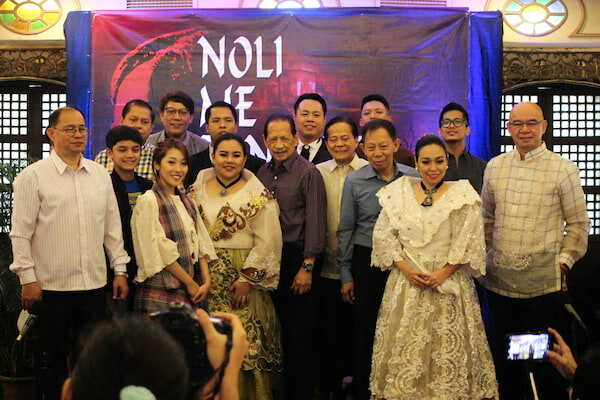 “Expect a brand-new production of the 'Noli Opera.' We will be using LED walls instead of mapping projections alongside physical set pieces, which create a more 'cinematic' look and feel,” says Sibal. 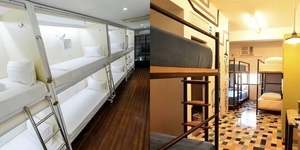 “Although it's very expensive to mount this opera, ambitious even, we'd like this new production to be more affordable to students* (*tickets at 50 percent off, suggested by CCP) and the art enthusiasts. Major sponsors are Dusit Thani Manila, LumoXchange, UGEC, Ilustrado Restaurant, Las Casas Filipinas De Azucar, Pru Life UK, Aquabest, Pancake House, Chowking, Carlo Rossi, Pik-Nik, Raffa Sparkling, Gourmet Farms, Island Rose, MP School of Makeup Artistry, RiteMed, Philippine Women's University, and Saint Paul University. Media partners include People's Journal, People's Tonight, Women's Journal. PTV, Chinoy TV, WhenInManila.com, SkedSearch, Fab Manila, Gololy, 98.7 DZFE, Wazzup Pilipinas, and Mark Francis Parallag Photography. The opera is performed with English supertitles. Performances: March 8 (Fri.-Gala), 8 p.m., March 9 (Sat.-Matinee), 2 p.m., and March 10 (Sun.-Matinee), 2 p.m.
Matinee: Orchestra Center – P2,800, Orchestra Side/Parterre – P2,300, Balcony I Center – P1,400, Balcony I Side – P1,200, and Balcony II Center & Side – P900 50% off for students, 20% discount for senior citizens, PWD, government and military personnel. 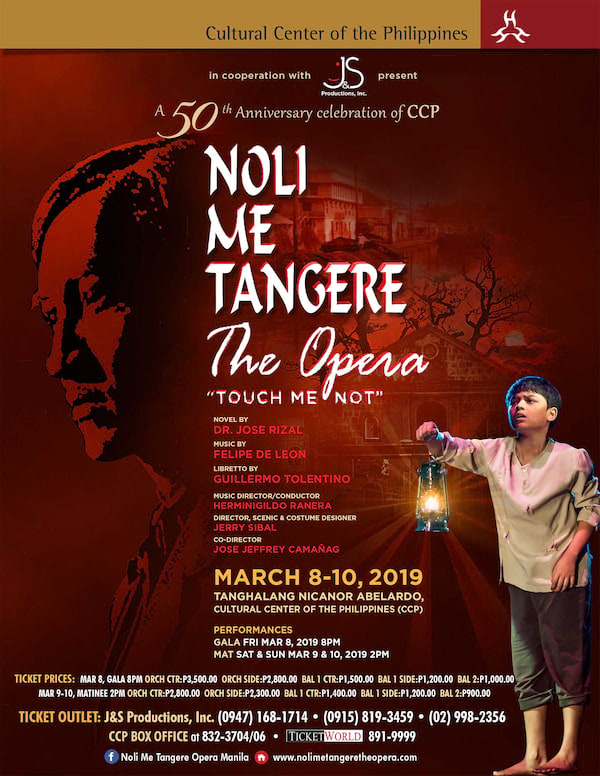 'Noli Me Tangere, The Opera' Returns to the Cultural Center of the Philippines this March!